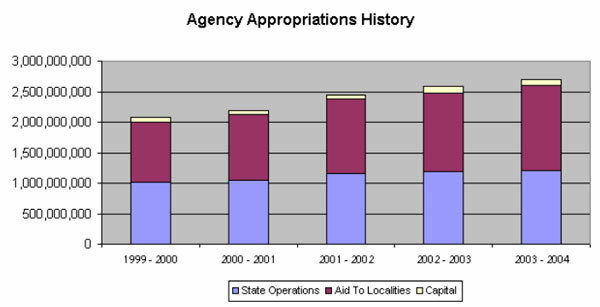 * 1999-00 through 2001-02 reflect enacted appropriations. * 2002-03 and 2003-04 reflect Executive recommended appropriations. The Office of Mental Retardation and Developmental Disabilities (OMRDD) administers a statewide system of care for more than 125,000 persons with developmental disabilities such as mental retardation, cerebral palsy, neurological impairments and autism, and their families. Services are coordinated regionally through 13 Developmental Disabilities Services Offices (DDSO) across the State. Those services may be provided at either State operated community based facilities or facilities operated by not-for-profit providers. The combined system provides 36,600 persons with certified residential services, another 65,000 persons with community day services and assists 73,000 persons to continue living in their own homes. In the State operated segment of the system, OMRDD expects to employ a workforce of 22,245. Many of these workers will provide direct care services while others will license and regulate the not-for-profit provider network of more than 600 agencies that provide residential and day services. Direct services are also provided by State operated residential and day programs that are based in the community. The Executive proposes eliminating the Youth Opportunity Program that provides part-time employment in mental hygiene facilities for disadvantaged youth in danger of dropping out of school. OMRDD projects that State operated developmental centers will operate with a census of 497 as 130 persons are moved into community placements. In addition, OMRDD operates 1,063 special unit beds to treat an especially challenging population in an environment that holds them securely and safely. The NYS-CARES program that provides residential and day services to persons who had been on waiting lists for services is entering its fifth and last year. By March 31, 2004, nearly 5,000 beds will have been added to the community residential system, as well as new day services and in-home services. The Executive proposes a NYS-CARES II initiative to develop 1,900 additional beds, 370 day service opportunities, and 600 new in-home care service opportunities. Most of the services to be provided are eligible for Federal Medicaid reimbursement, which normally requires local governments to pay a matching share. In order to encourage local governments to support the concept of moving developmentally disabled persons out of institutions and back to their home communities, the State agreed not to require certain localities to pay a Medicaid share. The Executive now proposes capping this "overburden aid" at calendar year 2002 levels effectively requiring local governments to share in the cost of any future program expansion, including NYS-CARES II. This agency is included in the Health and Mental Hygiene appropriation bill. 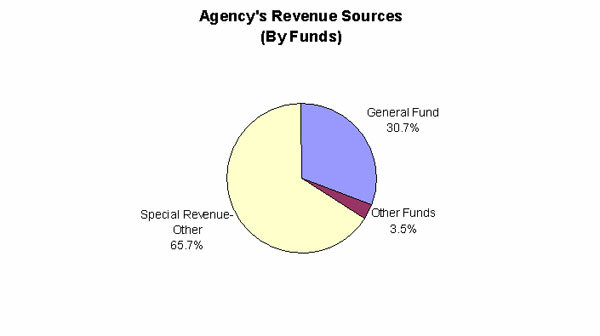 The Executive proposes an All Funds State Operations appropriation of $1,203,550,000, a net increase of $5,148,000 or 0.4 percent due primarily to an increase in Special Revenue-Other funds. This change is achieved through increases totaling $34,565,000 that are derived from: $20,356,000 in negotiated salary increases; $5,795,000 increase in the provider tax assessment which will generate Federal Medicaid revenue; $4,324,000 increase for 48 new State operated community beds; $2,231,000 increase to phase in 30 new secure Local Intensive Treatment beds, and $1,859,000 increase for 20 new beds to serve persons with mental retardation and mental illness. 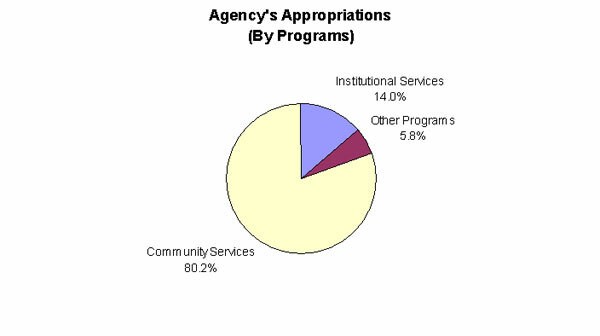 These increases are offset by savings totaling $29,417,000 that are achieved from the following actions: $11,868,000 from closing the Institute for Basic Research in Mental Retardation and Developmental Disabilities; $7,400,000 from administrative efficiencies, controlling overtime and automation; $4,235,000 through hiring restrictions; a $4,164,000 decrease from annualization of prior year bed closures; $1,300,000 through elimination of the Youth Opportunity Program; and $450,000 in miscellaneous savings. an increase of $11,719,000 for Joint Venture Clinics. These increases are offset by decreases totalling $54,434,800. The most significant action is the cap on Overburden payments at 2002 levels for a savings of $19,500,000. Other saving proposals include: a decrease of $8,005,000 for the annualization of SFY 2002-03 efficiencies; $12,300,000 by requiring not-for-profit providers to find efficiencies and re-basing ICF reimbursements forward to 1999; $5,200,000 by changing the timing of State aid payments for sheltered workshops; $6,772,000 from maximizing Medicaid coverage of employment services and eliminating a dry appropriation for VESID services; and $2,657,800 from elimination of legislative initiatives. The Executive proposes an All Funds Capital Projects appropriation of $90,081,000, a decrease of $26,532,000 or 22.8 percent. abolish the Institute for Basic Research in Developmental Disabilities.